'Last Train to El Paso': Who killed Thomas Lyons? Jerry J. Lobdill did some modern-day detective work and uncovered what some historians and other writers are calling a "dynamite story, a long-forgotten but important episode in Western history." Lobdill's new book is "Last Train to El Paso" (Cross Timbers Press), billed as the mysterious unsolved murder of New Mexico cattle baron Thomas Lyons of Silver City. "I'm convinced that this is an important new piece of information about the West and the closing of the Wild West that really needs to have a wide audience," Lobdill, a retired research and development physicist and chemical engineer in Fort Worth, said in a recent telephone interview. Thomas Lyons, a prominent Grant County civic leader, owned a ranching enterprise spread over 1.5 million acres. He was murdered not long after he arrived at Union Station in El Paso on May 17, 1917. Witnesses later said a mystery man had met him at the train station. Lobdill contends that the case, one of the most sensational crimes in El Paso history, resulted in a gross miscarriage of justice. T.J. Coggin, portrayed in newspapers as a wealthy El Paso cattleman, and his younger brother, Millard Coggin, were indicted as co-defendants, along with Felix Jones, identified as the hit man who killed Lyons. Charges against the Coggin brothers were eventually dismissed and someone bought Jones a pardon after he was sent to prison, Lobdill writes. Lobdill suggests that neither the press nor law officers at the time seemed to care that T.J. Coggin and T.A. Morrison were at one time closely associated with Jim Miller, a notorious outlaw and killer who was lynched in 1909. The book identifies Morrison as an unindicted co-conspirator in the Lyons case. 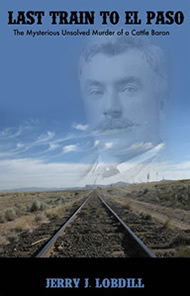 Paul Cool, an Old West author, writes in the book's blurbs: "In a narrative based on surviving court records, newspaper accounts, and private documents not intended for daylight, Lobdill makes a strong case that, nearly a decade after the vigilante hanging of 'Killer Miller,' the feared assassin's tactics were used by surviving criminal associates to intimidate El Paso's officers of the court into burying the murder of a New Mexico cattle king." "I think that's what happened," Lobdill said. "There's no other way you can explain the lame excuses the district attorney gave to Mrs. Lyons for dismissing these charges." Lobdill stumbled onto the Lyons case after attending a Wild West History Association roundup in Ruidoso in 2010. He first became interested in exploring Miller's role in the death of lawman Pat Garrett, who was shot to death in 1908 in the desert east of Las Cruces. Garrett had been famous for killing the even more famous outlaw Billy the Kid. Lobdill later mined archives, including old El Paso Morning Times and the El Paso Herald newspapers, for details about the Lyons case. He also had access to Lyons family files that were used to produce an earlier book about the case. Lobdill plans to do a book signing in El Paso in the future. He has a book signing at 2 p.m. Aug. 9 at the Silver City Museum. "I'm hoping that this book will give some closure to the Lyons family and repair his reputation to some extent," Lobdill said. "To this day, there are some people in Silver City who think he was a ruthless character." Ramón Rentería may be reached at 546-6146.